Every page — electronic or print — needs a big photo or graphic as an anchor to pull together all the stories, headlines and other elements. That’s what page designers often call the “lead art.” Now, as newspapers emphasize video, I notice The New York Times is using embedded video as main online art. 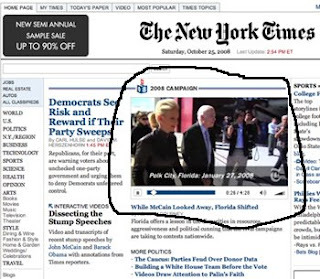 Check the screenshot (above) of the paper’s homepage; the video still image that I’ve circled illustrates a story today about Sen. John McCain‘s prospects in Florida. Do you use video as main online art? Please post your replies in the comments section, below. To e-mail confidentially, write gannettblog[at]gmail[dot-com]; see Tipsters Anonymous Policy in the green sidebar, upper right. The Star told the story with lots of visuals. That’s what I would have done; by now, all the hard-news angles should have been hit. In addition to the print package, I saw online a well-edited video (embedded, below); two distinctly different photo galleries; plus an online refer box to 12 related posts on blogs. Indeed! With a bigger digital shop, your paper could come closer to matching what the Star just did. Indy’s a big operation: well over 1,000 employees — and growing, with the addition of one of the two new regional finance centers. Plus, Star Publisher Michael Kane leads Gannett’s Interstate region of papers; HQ is in Indianapolis. 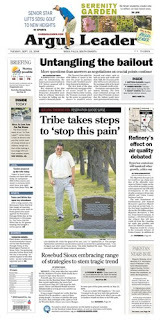 The Argus Leader in Sioux Falls has published a terrific public-service examination of rising suicide rates among the Sicangu Lakota people, on the Rosebud Reservation in south-central South Dakota. The three-day series ended yesterday. The paper publishes video (above) by reporter Steve Young, who interviews a mother of a suicide victim, plus young people who survived suicide attempts. That’s a great addition on a subject as emotional as suicide — and quite an accomplishment. Historically, suicide rates have been highest in the Mountain States — a fact that often surprises outsiders who think of the area as too peaceful to bring about such a sad end to life. I wrote about suicide in a project, too — at the Idaho Statesman in Boise, so I appreciate the Argus Leader‘s multimedia, something we didn’t have back then. The paper correctly describes suicide rates — rather than numbers of suicide, an important distinction when comparing data across population groups. Rates are typically expressed in a number per 100,000. I’ve often seen much bigger media get that wrong. For example, they’ll report that last year’s murder rate rose to 57 from 43 in 2006. They mean the number of cases rose to 57 from 43. A Gannett Blog reader recommended this series. Got some good work worth spotlighting? Let’s hear about it! Please post your replies in the comments section, below. To e-mail confidentially, write gannettblog[at]gmail[dot-com]; see Tipsters Anonymous Policy in the green sidebar, upper right. Gannett newsrooms spend untold hours, producing videos in search of new reader-viewers and the lucrative advertising that GCI hopes will follow. And that’s after the company spent a small fortune on training. Yet, I continue to receive notes from my readers, saying that viewership is abysmally low for videos except those showing fires, traffic accidents and a handful of other subjects. How many videos does your paper or TV station produce weekly? Do newsroom employees have a mandatory production quota? What videos draw the most viewers — and which ones draw the fewest? What did your paper or TV station give up in order to produce videos? What are the CPM advertising rates for videos at your worksite? Earlier: We’ve trained a million — no, a billion on video! Plus: In video of the moment, The Indianapolis Star talks to drunks! I’ve just programmed takes from the 1941 classic in the YouTube player, near the top of the blue sidebar, right. The movie traces the life of newspaper publisher Charles Foster Kane, a man whose career was born of “idealistic social service, but gradually evolved into a ruthless pursuit of power and ego at any cost,” Wikipedia says. Citizen Kane was directed by Orson Welles, who also played the lead, inspired by real-life newspaper mogul William Randolph Hearst. Video of the Moment: Indy Star talks to drunks! Got a video to, uh, recommend? Please post a link in the comments section, below. To e-mail confidentially, write gannettblog[at]gmail[dot-com]; see Tipsters Anonymous Policy in the green sidebar, upper right. Bridezilla II: ‘Jilted’ ex-Gannett HR director talks! Shell’s breach of contract suit revealed her pay in Pensacola, Fla., where she worked for a short time in 2006, before following her fiance to Gainesville, Ga. Shell now makes $31,000 a year at North Georgia College & State University. Here she is in an earlier interview, via The Associated Press. “Saw a report of a plane crash on my news pager about 20 minutes from my house. Got there at about 7:30 p.m. and shot a quick photo that was transmitted back for a web update. Continued shooting the video on the plane crash until at about 10:30 p.m. got another report on my news pager about an apartment building fire with people jumping out windows. The news gods were with me, since this was just across the Shark River from where the plane crash was. “Zoomed over there and was able to get video of victims still being loaded in ambulances. Grabbed a few stills from the video and sent that back for a web update (these were very late for our Sunday paper — but they managed to find space). Shot more video and got done there at about 12:30 a.m. Went home to edit both videos and produce a photo gallery of the fire that were all on the web by 4:30 a.m. And then I slept.